Welcome to this week's edition of the Sunday Open House series. 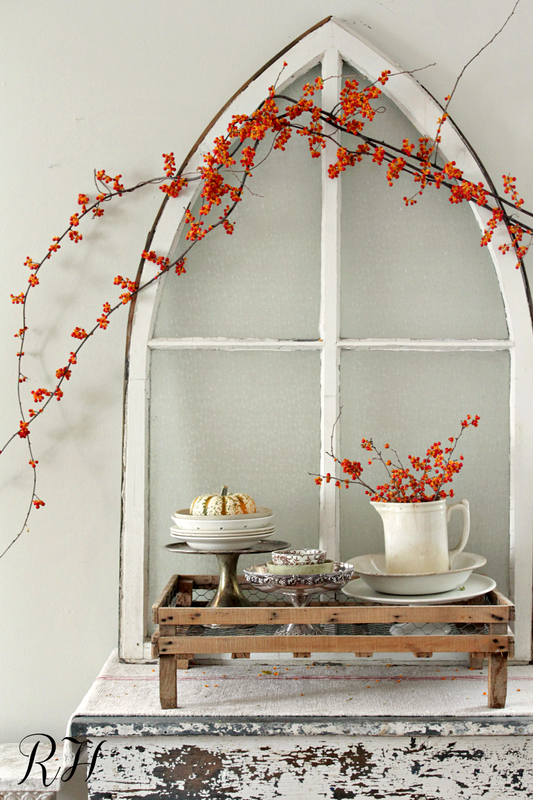 Today's feature is filled with vintage eye candy and beautiful photography and styling. 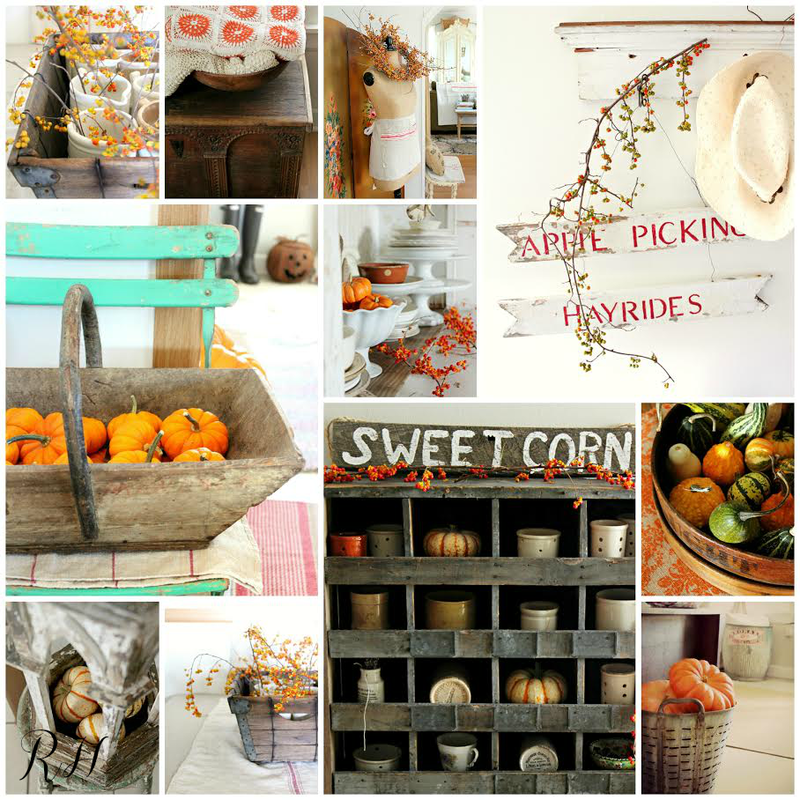 Our guest is the talented Maria from Rusty Hinge and she's sharing pictures of her collection of timeworn treasures and some fall decorating ideas. I've been a fan of her style for years and am honored to have her here today. Maria is so sweet and was happy to be the featured guest this week. Take a look at her collections and her stying. You'll fall in love with style too! And now, here's Maria with a little bit about her home and style. Two years ago, we left behind our hundred-year-old farmhouse tucked into rolling farm fields and purchased an early 20th century Victorian home right in town. Being a country girl, the change was quite an adjustment for me, but I am getting there! Our Victorian is complete with all original woodwork, open stair banister, high ceilings and lots and lots of wallpaper. 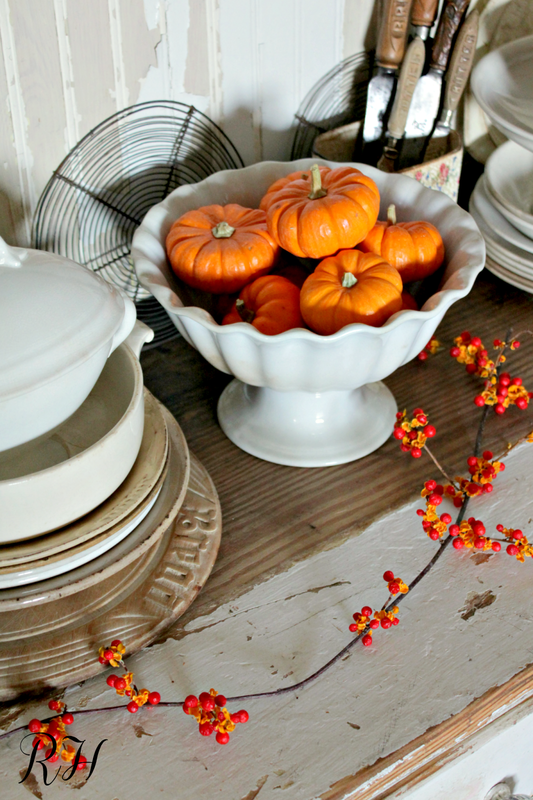 Currently, we have begun the tedious task of removing all the wallpaper among other renovations and have made a bit of a mess here so the feature is a previous fall home tour of our old farmhouse. I have always been drawn to the chippy, shabby and old; those pieces that are bursting with the imperfect character and patina which tell the story of ages past. 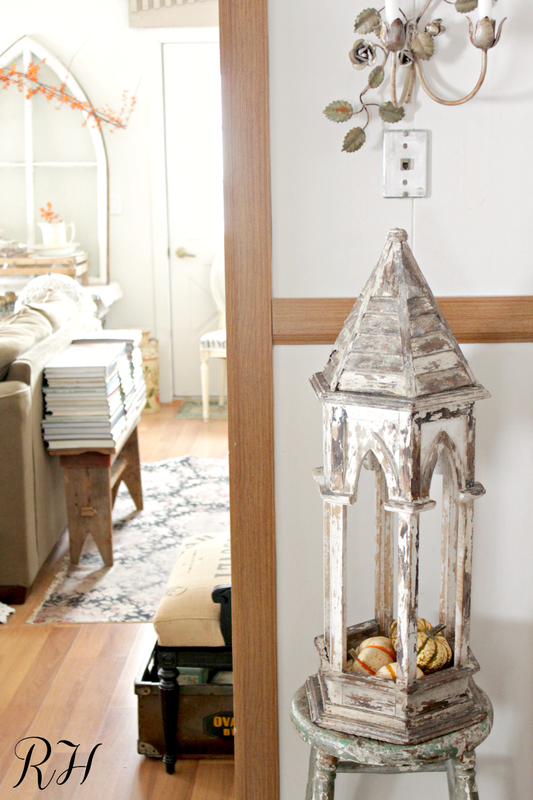 It isn't hard to spot these vintage pieces throughout our home. 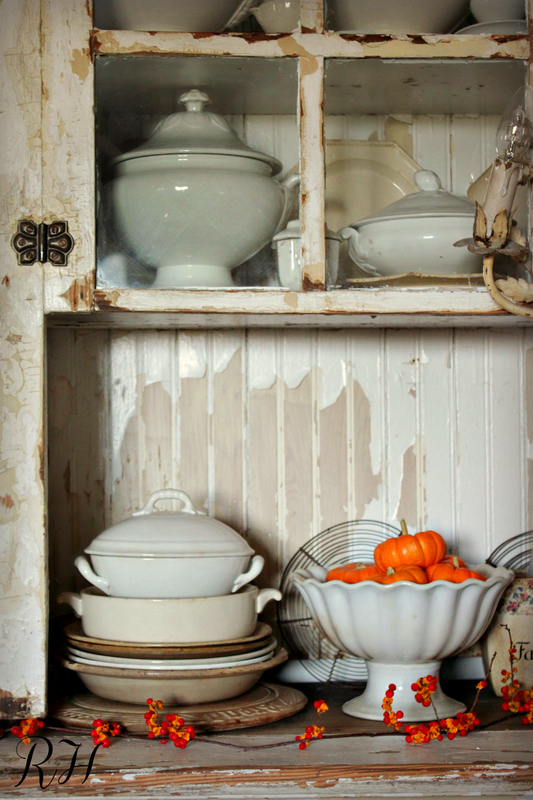 I also love to collect and display collections such as antique European ironstone and vintage French grain sacks. 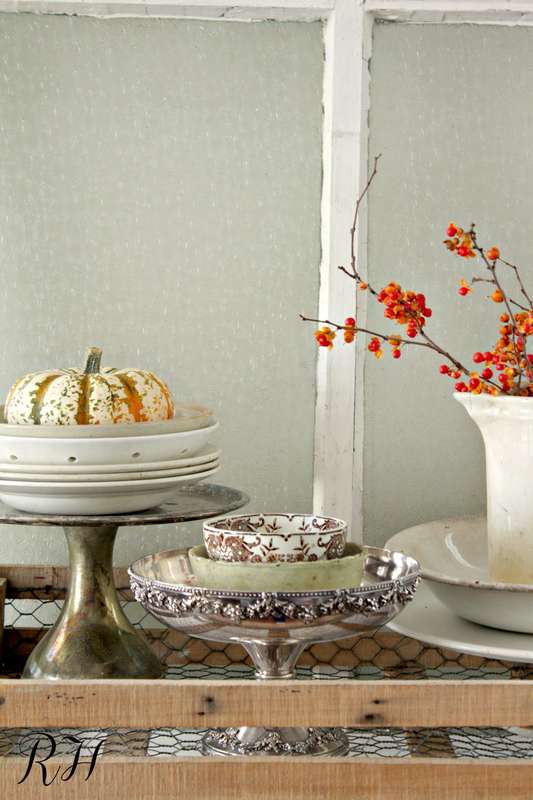 When decorating a room, I often take one or two pieces from these collections to display. I surround myself with pieces I love and I always say while out at the flea market if I love it take it home and make it work! 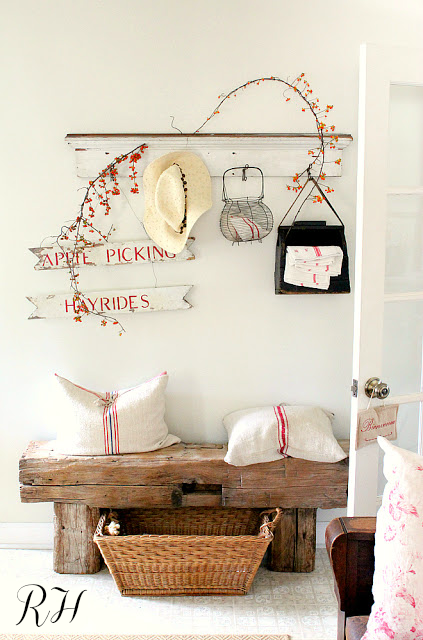 Weathered and time-worn flea market pieces pave a way straight into my heart and I love filling our space with them! To check back and see how we are coming along with the new changes to our Victorian, come by rustyhinge.blogspot.com for a visit! 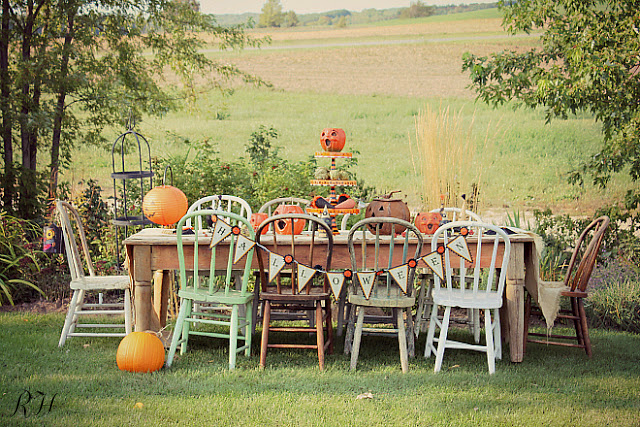 Isn't this a fun Halloween setting? Look at all those crocks! Swooning! That window.....and she has everything styled perfectly. 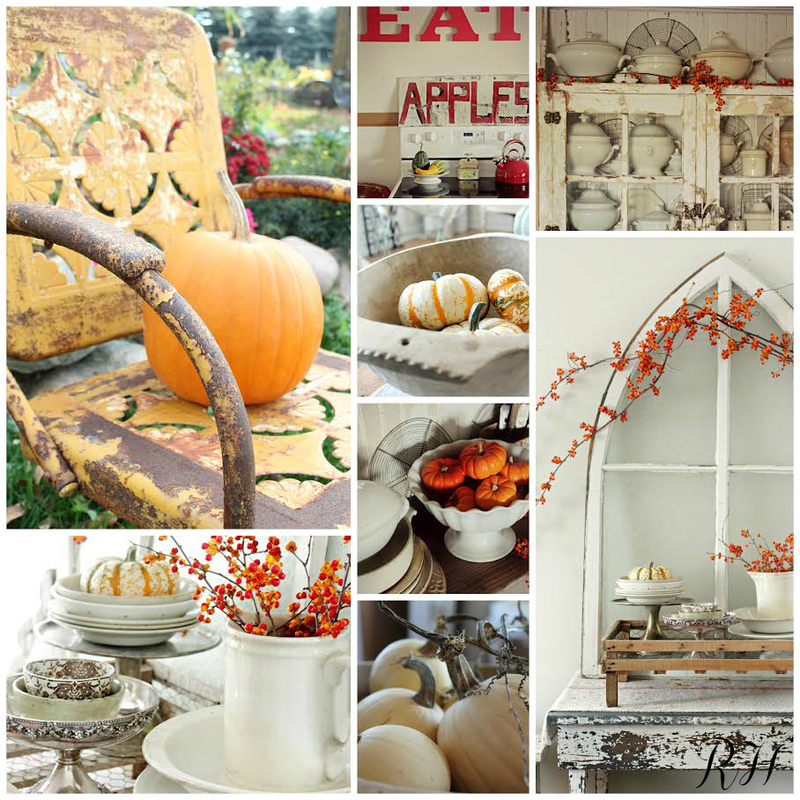 I love the wooden bread plate and the bittersweet looks perfect for fall. 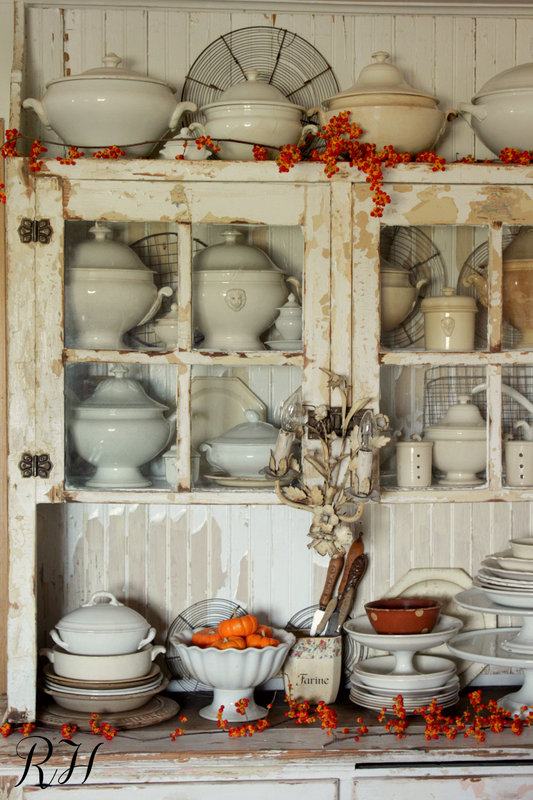 Have you ever seen a prettier collection of ironstone? 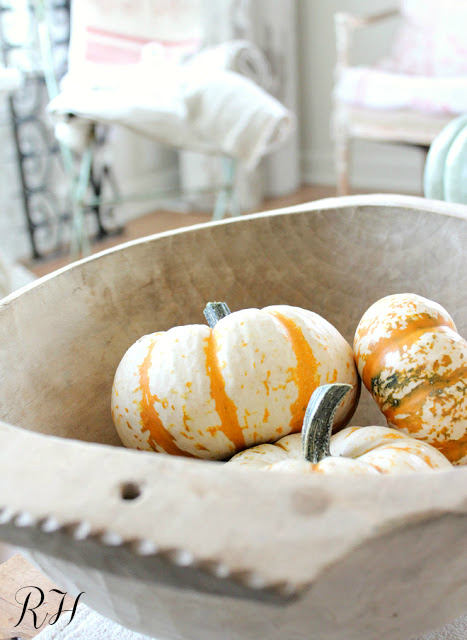 I love all those soup tureens, don't you? 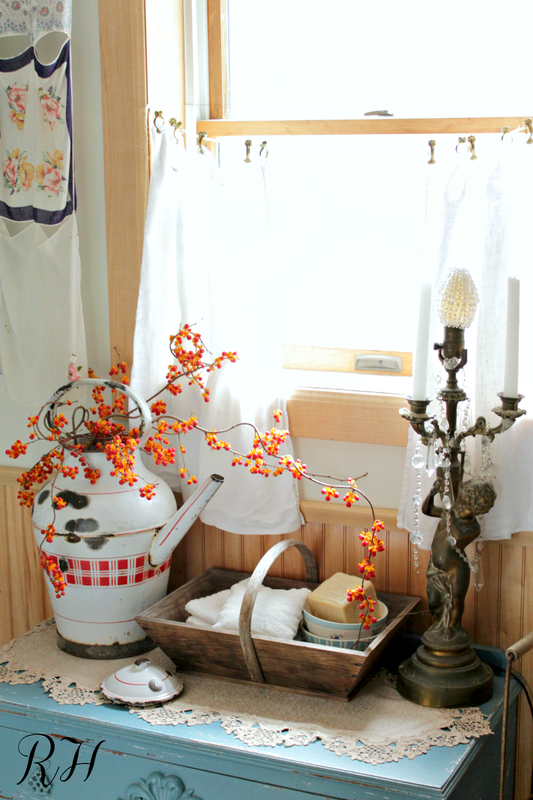 Another nice vignette with a vintage French enamel kettle and trug. 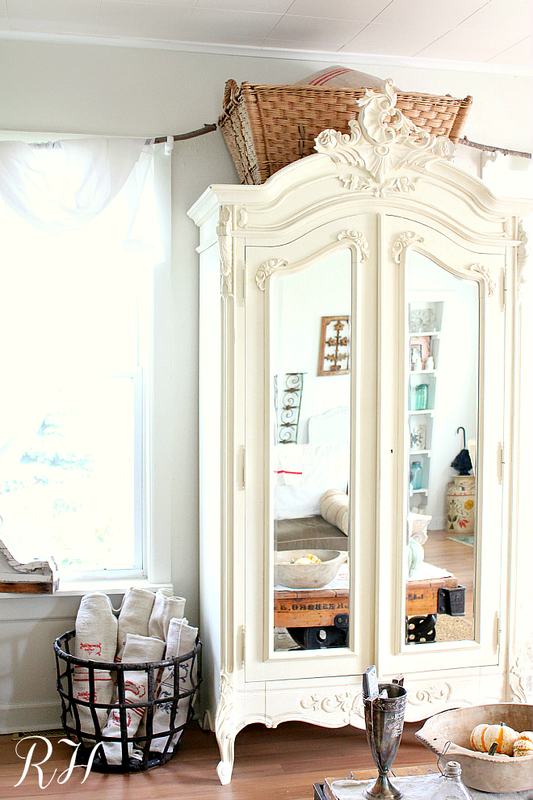 The armoire, the grain sack, the basket on top...it's all so nice. 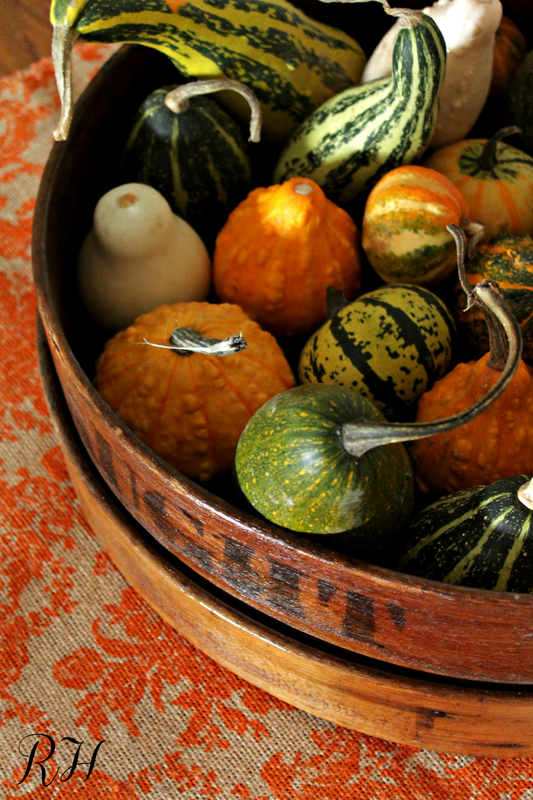 The mini pumpkins look right at home in her vintage wood dough bowl. Love the styling and photography. Isn't this cute? 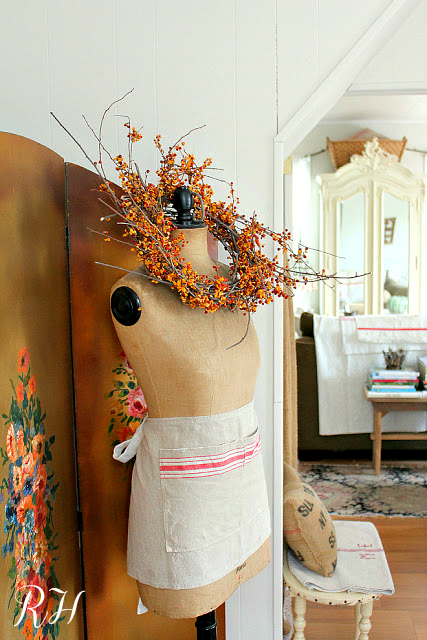 I never would have thought to put an apron on a dress form. So clever! Sigh. I need more grainsack in my life, don't you? And that wire egg basket is so sweet. 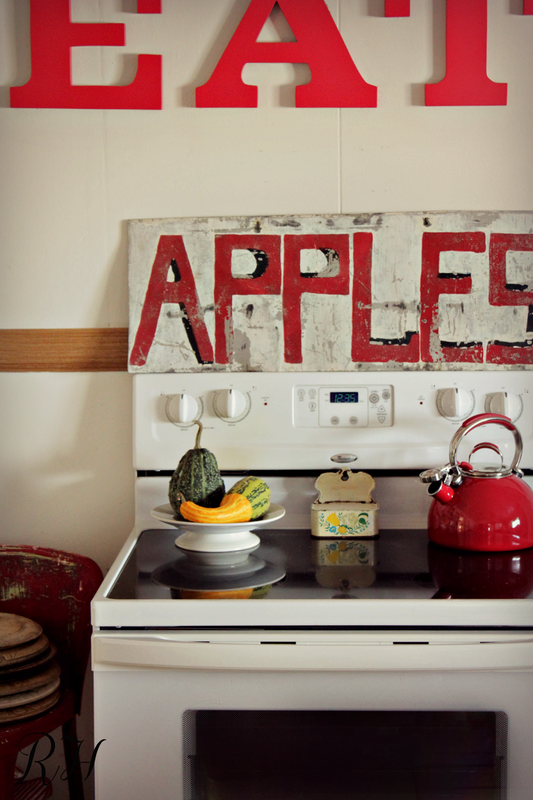 Such a fun collection of vintage tins on top of her refrigerator! 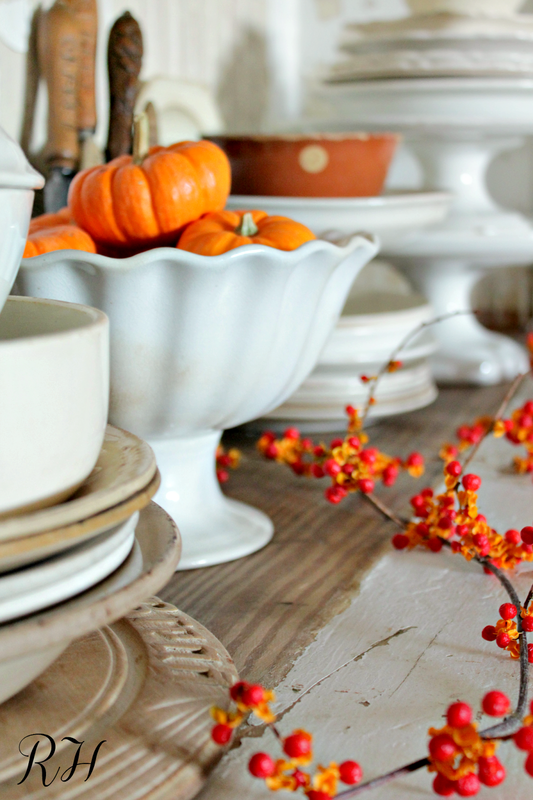 Chippy paint and ironstone gets me every time. Isn't this a cute sign? Her bench makes a great place to store her books. Thanks so much for allowing us to peek inside your home, Maria! 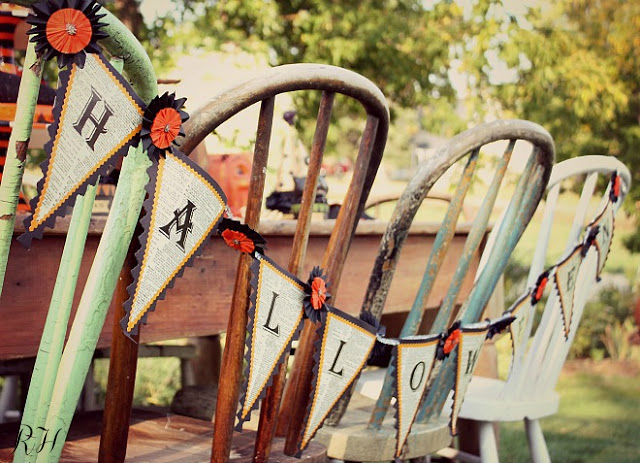 Now I want to go out and search for more vintage treasures for my own home! 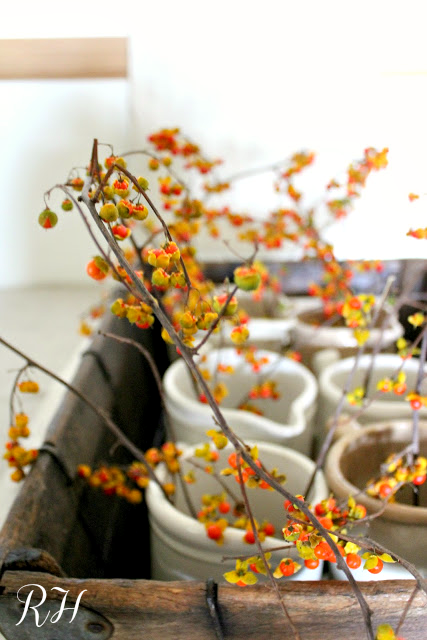 Follow along with Maria and Rusty Hinge on Instagram, Facebook, or on her blog here. 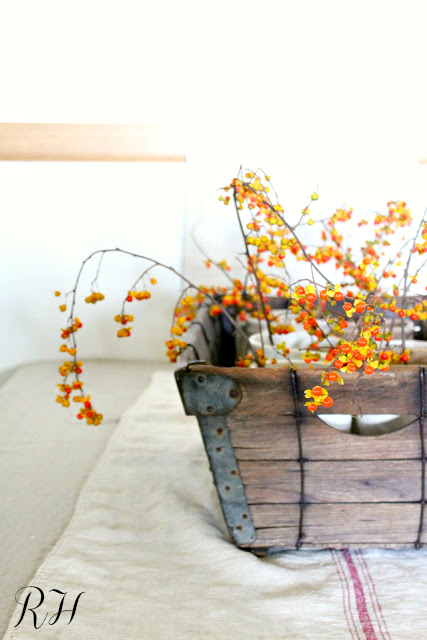 Want to see more beautiful home tours? Click here or on the image below. 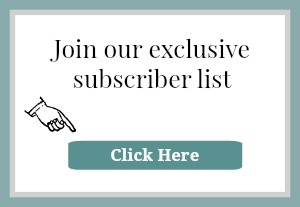 Never miss a home tour or decorating idea by subscribing to updates! Click here or on the image below. 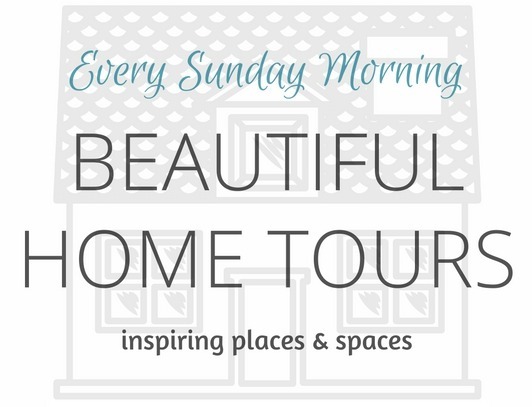 Wow - gorgeous home tour! That first photo looks like a painting. Just beautiful. 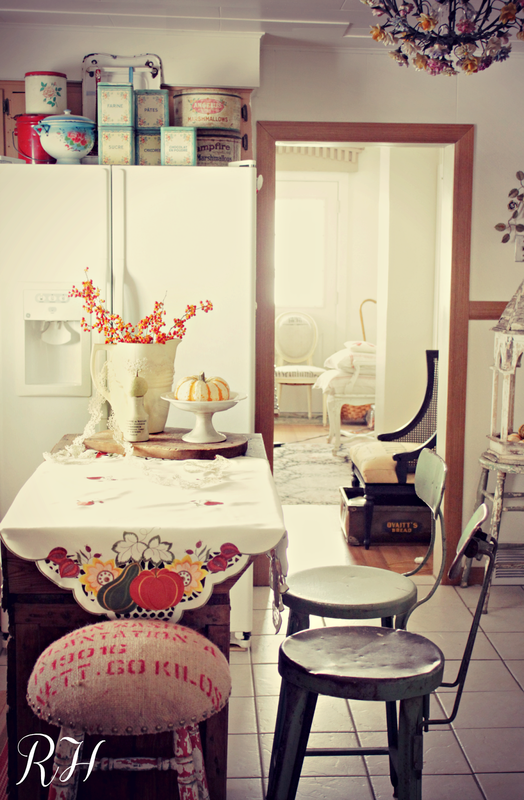 I adore Maria's style and home. 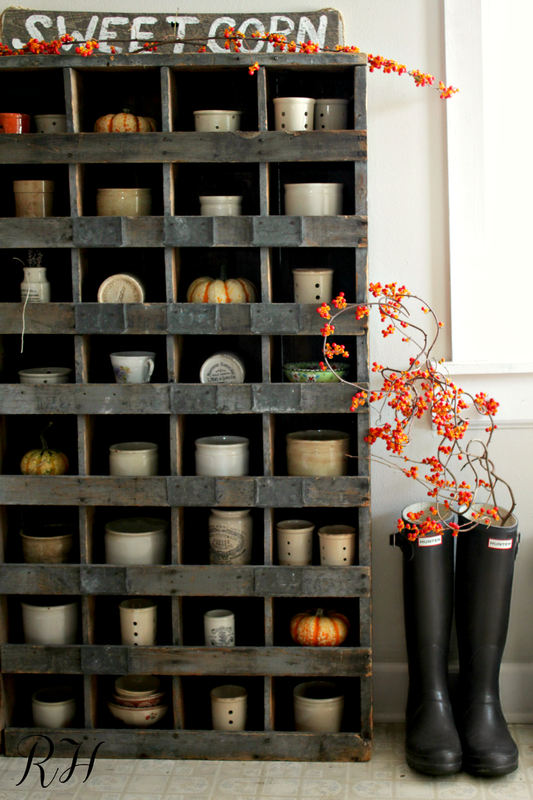 She has so many fabulous collections and has the perfect touch for displaying them. Love seeing her old farmhouse again. I absolutely love her style! She has so many wonderful chippy pieces. Each photo had me oohing and ahhing! Thanks for sharing.